Max Montoya grew up with humble beginnings in La Puente, California. His loves were both little league baseball and football. Ultimately football won out and Montoya made his presence known while at Mount San Antonio College in Walnut, California. His dominance on the field earned him a scholarship to play at UCLA after his sophomore year at Mount SAC. As a UCLA Bruin Montoya played for Head Coach Terry Donahue as a starting tackle and guard from 1976-78. While at UCLA, Montoya and his teammates formed one of the best offensive lines in their conference. Montoya’s individual honors at UCLA include Pac-8 honorable mention at Left Guard (1977), 2nd Team All Coast (1978), George W. Dickerson Award (1978) and Montoya was a member of the Japan Bowl All Star Team (1979). Montoya also started in the Liberty Bowl (1976) and the Fiesta Bowl (1978). His performance as a Bruin also got Montoya noticed among several NFL teams. Montoya was drafted in the 1979 NFL draft by the Cincinnati Bengals, the 168thoverall pick in the 7th round. His playing career would span 16 seasons, eleven with Cincinnati (1979-89) and his final five back in his hometown with the Los Angeles Raiders (1990-94). During those 16 seasons Montoya would go on to be named to four Pro Bowls, play in two Super Bowls and for an offensive lineman, amassed an impressive 223 games played. 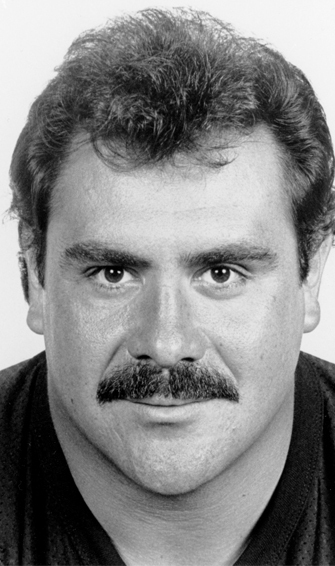 Montoya was also named 1st Team All Conference by Pro Football Weekly and United Press International (1986) and the Lite Beer/NFL Lineman of the Year (1987). Additional awards include being named 1st Team All Conference by the UPI (1988 and 1989) and 2nd Team All NFL by the Associated Press (1989). Pro Football Reference would name Montoya to its 1st Team All 1980’s team. Montoya’s cumulative career would pick up more honors after his football days came to an end. Inductions to Hall of Fames as a result of his illustrious career include: Community College Football Association Hall of Fame (1989), Mount San Antonio College Athletic Hall of Fame (1992), California Community College Athletic Association (CCCAA) Hall of Fame (2000) The National Hispanic Sports Hall of Fame (2012) and now the Latin American International Sports Hall of Fame (2019). Montoya’s greatest accomplishments would be his family. Montoya and his wife Patti have twins, Alison and Matthew and are the proud grandparents of Addison, Abigail, Penelope and Emerson.